I had two learning goals for the lesson. (1)Provide a context for slope and y-intercepts. (2) Understand that linear functions have a constant rate of change and can be represented in multiple ways. 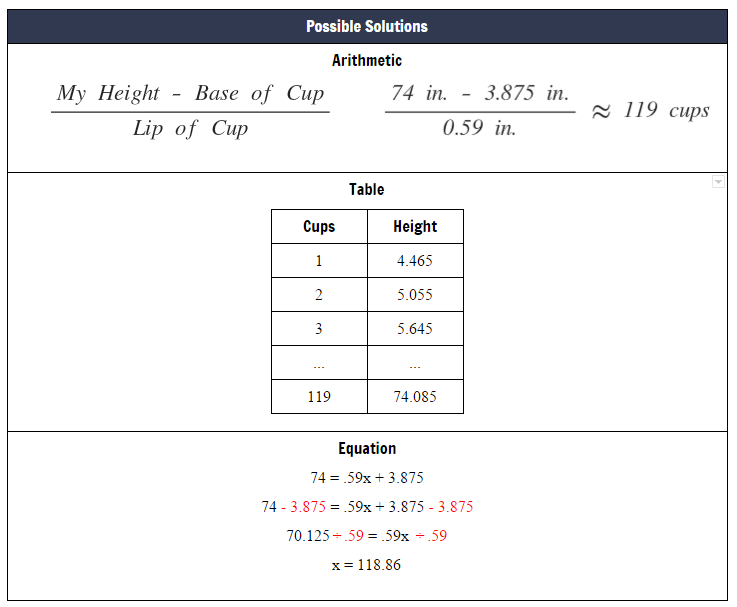 I chose Stacking Cups because it’s my favorite activity for introducing linear functions. It lines up perfectly for slope-intercept form, and the kids always have fun stacking cups as tall as the teacher. I’m usually in favor of any hands-on component as well, and this lesson provides plenty of that. For the anticipation process, I tried to predict different strategies and mistakes by working the problem out in many ways. I created the following charts for organization. After creating the list of possible solutions in the anticipation stage, I actively looked for these strategies during the group work session in order to take note of which groups were using what strategies. Here’s the monitoring chart I used. As the groups worked, I noticed that most were using arithmetic in order to solve the problem. However, there was at least one group in each class that used an equation. Since most of the groups used the arithmetic method, I had one group present this method from each class. I also selected a group that used equations. Also, I chose speakers based on who has and hasn’t presented in the past. I want to make sure as many students as possible get a chance to be the “expert” throughout the year. For the sequencing process, I decided to have a group present the most commonly used strategy first. This is a recommendation from the book that I like because it allows the highest percentage of students to have investment in the presentation process. Since most of the groups used the arithmetic method, they would be immediately curious to see how the first presentation compared to their work. After a group presented the arithmetic method, I had a group that used equations present next. Specifically, I wanted to highlight their thought process for determining where to put the numbers in the equation. The intention was to lead the class closer to an understanding of slope and the y-intercept. Solid post here Dane! I’ve really embraced the 5 practices this year and I appreciate you fleshing out your thoughts and ideas. Thanks Graham! Great idea! I’ll make sure to include a picture of the sheet on the next post. Unfortunately, I threw away the other ones haha.